Domain names in our modern society are the real estate of the modern Internet connected world. In some cases, a company will spend up to 10 figures in securing the most coveted domain addresses. For all businesses, their domain is a crucial part of their branding and sales channels in 2017, and it looks like that trend will continue as the world becomes smaller and Internet adoption reaches the far corners of the globe. The world of domains can be complicated, with more TLD (Top Level Domain) options and less of the common TLD domain names available. But fear not, WebsiteBuilderau has put together some great facts and information to bring you up to speed on the real estate of the Internet, domains. Paul Mockapetris invented the domain name system in 1983 and the first domain Symbolics.Com was registered March 15th, 1985. For 10 years, domains were free to register until 1995, and in 1998, the entire domain name system was privatized and ICANN, a body that manages global domain names, was created. In 2000, VeriSign acquired Network Solutions, the company who was selling .com, .net and .org domains. Between 2007 and 2010, a boom in domain prices saw many big-priced domain purchases. The highest being Carinsurance.Com, which fetched a price tag of $49.7 million USD. As of 2017, there are over 1500 TLD’s available to choose from, and over 330.6 million domains are registered, with more being registered daily. A TLD is the final part of an Internet address. For example, .com or .net are two popular TLD’s. TLD’s can be split into two main categories. The first are country coded TLD’s. These are usually based around a region or country. Examples of these country code TLD’s would be .ca (Canada) or .cn (China). The second are generic top-level domains. These are usually industry or niche-specific. An example would be, .music or .app. As many of the most common TLDs are running out of prime domain names, TLD’s offer brands a chance to get the name they want in the area or sector they operate in. As of the second quarter of 2017, the largest TLD with the most registered domains is .com, with 129.2 million registered addresses. China’s .ch was second, with 21.4 million domains, and Tokelau’s .tk was third with 19.1 million. Rounding out the top 5 is German .de with 16.2 million and generic TLD .net with 15.1 million domains. When it comes to registering a domain, there are a plethora of companies to choose from. The clear market leader is GoDaddy with 55.15 million registered sites. Its closest competitor, eNom, finished a distant second with 10.8 million addresses registered through their service. In 2017, domains are the primary tools for a business to brand and market itself online. A great domain is an equivalent to a prime shop location in generations past. 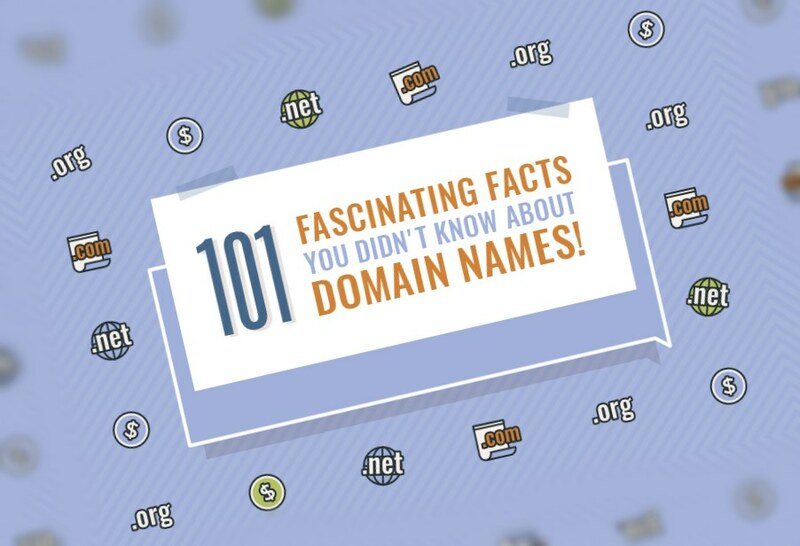 If you are looking for even more information on domains, TLD’s and the real estate system that powers the Internet, check out these additional fascinating facts.